2015 Domaine de Gour de Chaule, Gigondas “Cuvee Tradition” Southern Rhone, France. Vigneron Stéphanie Bonfils, following her mom’s absolute love of Grenache, continues to craft Domaine de Gour de Chaule’s Gigondas with that focus with 85% of the vineyards planted to Grenache, with about 10% dedicated to Syrah and Mourvedre, along with a tiny amount to Cinsault. This historic estate was started in 1900, but was not selling their own wine until the early 1970’s and not a serious domaine until Bonfils the elder got things rolling in the 1980’s, but since then has made a significant impact joining the greats of the region with traditional and authentic wines, joining the classics likes of Saint-Damien, Saint-Cosme, du Cayron, Grapillon d’Or, Montirius, Montmirail, Château du Trignon and La Bouissiere, as well as the new guys on the block L’Ourea and Kermit Lynch’s Les Pallieres. Similar to the more famous Chateauneuf du Pape, Gigondas is blessed with the sunny Mediterranean climate and clay and limestones soils, but they can be fresher and certainly less costly, with some having higher elevation vines that give a vibrant intensity to these heady full flavored Rhone reds. The average age of the Grenache vines planted within the Domaine de Gour de Chaule plots is 55 years old and Stéphanie uses whole cluster fermentations with cement cuves employed for both primary and malo (secondary) before being racked to used large foudres (oak cask) to rest, for about 18 months prior to bottling unfixed and unfiltered. This 2015 is brilliantly detailed, full bodied and shows the vintage’s depth and concentration perfectly, it delivers a warm rush of Grenache purity and character with sweet strawberry, boysenberry, kirsch and plum along with dusty stones (chalky), light floral notes, peppery spices, classic lavender (garrigue) and anise. 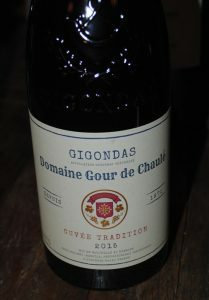 This feels rich and textured in the mouth gaining earthy elements and while deeply fruit driven there is a spine of fine ripe tannins that gives a sense of structure that holds the weight in check, it never feels too heavy or dull, it’s a beautiful old school Gigondas that really impresses the palate. Imported by Rosenthal Wine Merchant, Domaine de Gour de Chaule Gigondas “Cuvee Tradition” is always a treat and a bell weather for the year and this 2015 an absolute must for Rhone fans, enjoy it for it’s youth now or put a few away for exceptional mid term drinking, as it will reward some patience, best from 2018 to 2026.